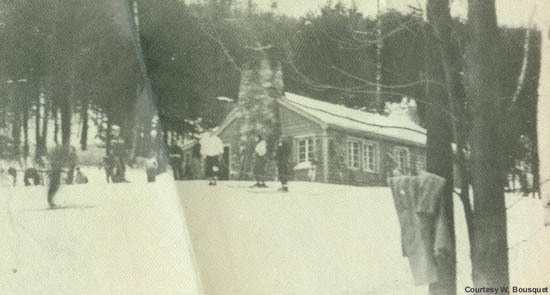 Civilian Conservation Corps Companies 108 and 112 were stationed in Beartown State Forest in Lee, Massachusetts in the 1930s. 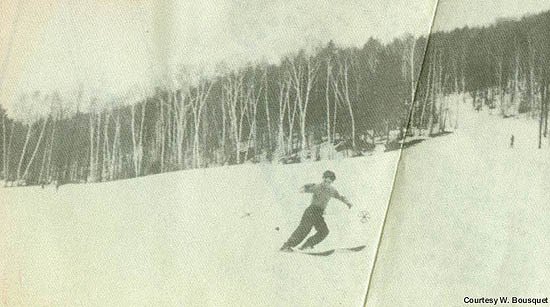 In 1935 ski trails were developed on the northern peak of Beartown Mountain. 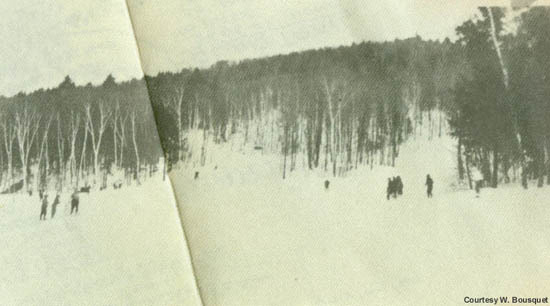 Two rope tows were installed on the lower half of the mountain, serving the Polar and Sedgewick slopes. In addition, at least three trails were cleared from the top of the mountain following the bear theme - Kodiak, Grizzly, and Polar. The ski area closed at some point in the 1940s, but was reopened in 1951-52, featuring top to bottom rope tow lift service. 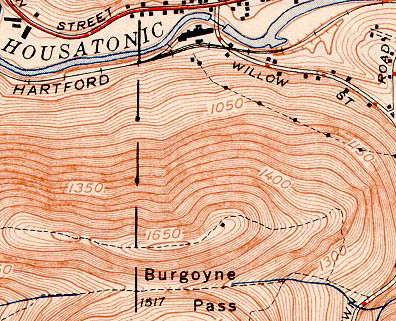 The area was operated in the 1960s as Beartown Associates, Inc. by William T. McCormack. The area remained open through the winter of 1963-64. It was transferred to Wayne K. McCormack in 1981, then to the Commonwealth of Massachusetts in 1984. Today the ski trails are grown in, though some remains from the area can still be found. Grizzly was an expert trail located on the east side of the area. It became lift served in the winter of 1951-52. Kodiak was an expert trail located just west of Grizzly. It became lift served in the winter of 1951-52. Polar was an intermediate trail that opened into a wide open slope. The slope was lift served starting in the 1930s, however the upper trail was not lift served until the winter of 1951-52. 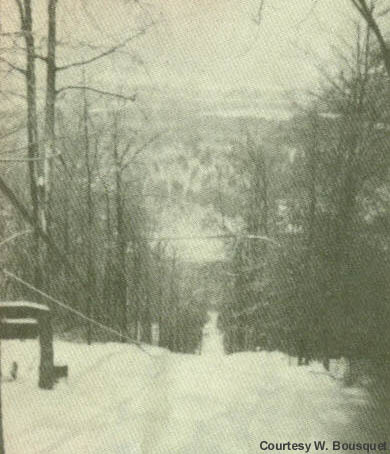 Sedgewick was a novice trail and slope that was lift served from the 1930s through the closing of Beartown Ski Area in 1964.
" 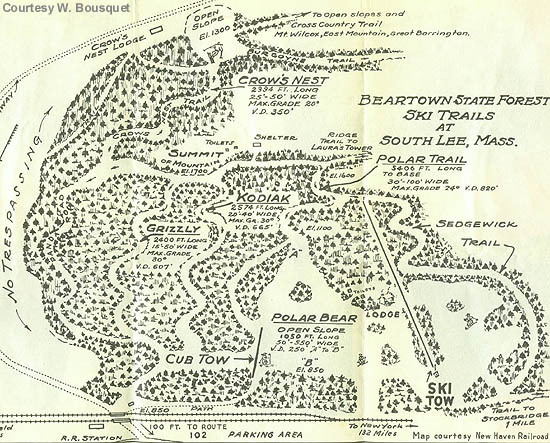 Beartown's genesis begins in 1935, when the CCC begain clearing trails and slopes at this area. " 24. Beartown State Forest. Developed for snow train crowds, near NYNH&H RR station at So. Lee. Two trails and open slope, wooded north exp. 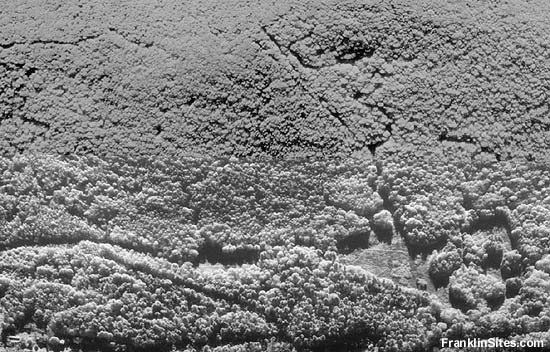 Polar Slope. Length: 1000'. V.D. 250'. Wdith 50-550'. M.G. 24 deg. Adapted for all classes. Kodiak Trail. Class: advanced. Length 2238'. V.D. 607'. Width: 15-50'. M.G. 30 deg. D.S. 6". Steep, hairpin turns and right angles. Grizzly Trail. Class: advanced. Length 2574'. V.D. 665'. Width 15-50'. M.G. 30 deg. Parallels Kodiak Trail and connects at top. 25. Open Slopes. Near the station two fine smooth slopes on private land. Other hills nearby. Two miles up road two CCC camps in 5000 acre reservation. Many trails and hills from here. " 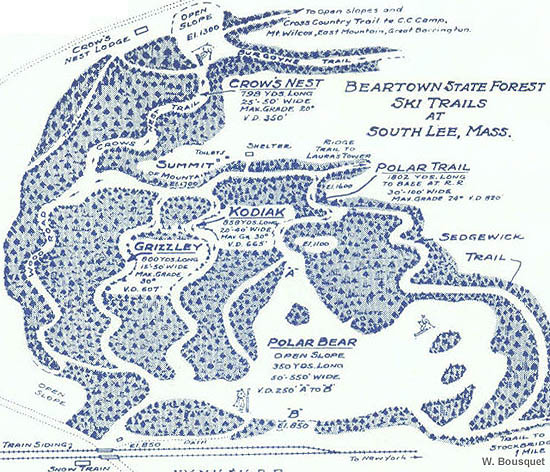 " In the Beartown State Forest, South Lee, there is now an alternative trail to the Polar Trail which avoids the 24 degree schuss by a 15 degree grade. Also now at Beartown are the Sedgewick (2000 feet) and Down Hill (500 feet) trails, the New Open (860 feet) and Semi-Open (400 feet) slopes. " " South Lee...Three and and two-thirds hours from New York on the Snow Express. This development is in the Beartown Mountain State Forest and adjacent to the railroad and Snow Train Station. The entire layout has been greatly enlarged during the past three years. There are long down hill trails, open slopes and cross-country trails. Special prepared spaced for the novice and a slalom run for the more efficient skier. The entire area of this great forest is available for cross-country skiers and connecting trails give an opportunity for some real mountain skiing to the summit of Mt. Wilcox, a round trip distance of ten miles. This development is unique in that the entire layout has been designed to fit in a wooded mountain area which gives it natural protection from wind and makes for a real skier's paradise. " " The tow at Beartown State Forest in South Lee will not operate regularly. " " The Beartown Ski Area in South Lee, Mass., has come out of the moth balls and made its first major improvement in 10 years. This was one of the first snow-train areas and some of the old timers may recall many a ski hour spent there. Two new tows have been constructed giving a vertical decent of 820 feet with two expert trails, each over one-half mile long, one intermediate run of 1 mile and a novice-intermediate run of two miles. And Al Prinz, the new manager, claims that only a minimum of six inches of snow is needed to provide good skiing. " Elkins, Frank. "Ski Centers Ready for New Season" The New York Times. 22 Nov. 1942. Pesko, Walt, and Dot Nadler. "Skiers and Skiing" Hartford Courant. 7 Dec. 1951.